AIANO flue guards come in all shapes and forms. Sometimes these fulfill a purely practical function, such as the flue guard AIANO recently installed at Kingston Community School. 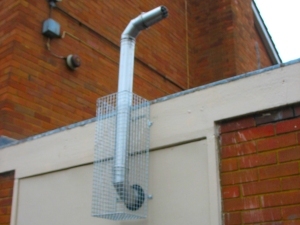 This type of guard are bespoke by their very nature and we usually ask customers to send us photographs, as well as dimensions of their flues. For Kingston Community School, AIANO was able to measure up the requirement during the AIANO site survey for the radiator and pipe guards at the school. 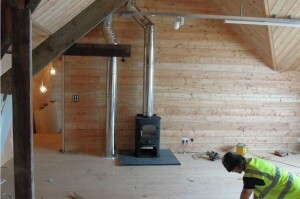 The guard was fitted by an AIANO engineer during the AIANO installation service. Sometimes however, the customer needs something that, while providing health & safety protection, also satisfies aesthetic consideration. For Porthmeor Artist studios AIANO designed just such decorative flue guards. Using the finest mesh and a non-standard beige coloured powder-coating, AIANO welders and wireworkers fabricated a set of guards that guarded the flues running between floors in these artists’ cottages in St Ives. Contact us today on T. 020 7987 1184 or sales@aianos.co.uk for more information about AIANO bespoke flue guard products and services.